After having posted the diary entries of Elizabeth House Trist on December 23 and 26 when she was traveling from Philadelphia to Pittsburgh, on December 26 I came upon the article “Trove of Information From the 1930s, Animated by the Internet” in the The New York Times. It reported on the completion of a project by the University of Richmond’s Digital Scholarship Lab to digitize one of the greatest historical atlases: Charles O. Paullin and John K. Wright’s Atlas of the Historical Geography of the United States, first published in 1932. The twenty topics in the atlas include, for example: Boundaries 1607-1927, Indians 1507-1930, and Political Parties and Opinions 1788-1930. 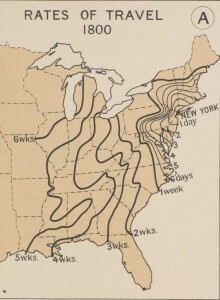 The digital edition reproduces all of the atlas’s nearly 700 plates but, in addition, many have been “georectified,” that is warped so that they can be placed on top of a digital map of the United States and moved from year to year to show changes during the time span under consideration. You can toggle back and forth between the two versions, plate and georectified; clickable sidebars provide underlying data and information about sources. 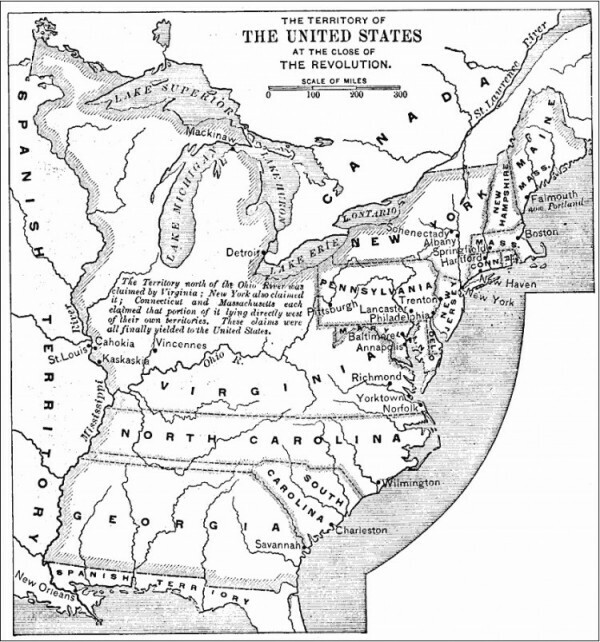 Naturally, the topics that appealed to me most were those that included information about the country during the Revolution and early nationhood: Public Post Roads and Stage Routes 1774, Plans of Cities 1775-1803, and Iron and Steel Works 1725-1775, to name a few. To get back to Elizabeth House Trist, I was particularly interested in Rates of Travel from New York City in 1800 under the heading Industries and Transportation, 1620-1931. The atlas plate is on the left. 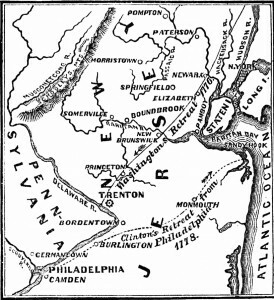 Although she departed from Philadelphia in the year 1783, I thought this map would provide fairly accurate information for Trist’s trip. In the digital image you can hover over a location for the time and distance to New York City. According to the map, the trip to Pittsburgh (276 miles) would have taken one week traveling at a speed of 1.6 mph. Of course this was unrealistic for Trist’s journey given the time of year and circumstances (see posts). She left Philadelphia on December 23 and arrived in Pittsburgh on January 9; her trip took two weeks and three days. Elizabeth House Trist was traveling to join her husband in New Orleans. Her diary breaks off on July 1, 1784, just above Natchez, when she heard the news that her husband had died while she was wintering over in Pittsburgh. 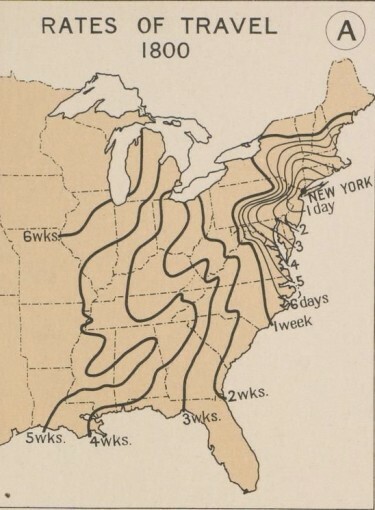 According to the digital map, the trip from New York City to New Orleans (1167 miles) would have taken four weeks in 1800, traveling at a speed of 1.8 mph. That estimate, of course, did not take into account low water on the Ohio and Mississippi, Indian unrest, what Trist called “a Passionate sort of climate,” and a host of other complications. Do spend some time examining the maps in the amazing Richmond project. Excerpts from Elizabeth House Trist’s diary can be read on pages 277-285 of In the Words of Women. My colleagues and I gave an illustrated reading of selections from our book In the Words of Women at Stony Point Battlefield, a New York State Historic Site, on September 22. 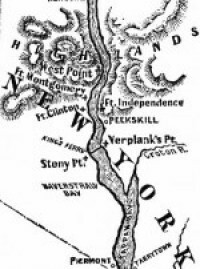 Stony Point was an American fort at a crucial location on the Hudson River adjacent to Haverstraw Bay, opposite Verplanck’s Point, and downriver from West Point. 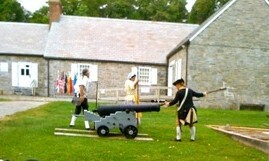 It was taken by the British during the Revolution, but in a midnight assault on July 16, 1779 the Continental Light Infantry, under the command of Mad Anthony Wayne, seized the hilltop garrison. The Americans waded through 3-foot deep water on the Haverstraw Bay side and made their way up a steep embankment with orders to use only bayonets so as not to raise the alarm. The British were surprised and, recognizing defeat was inevitable, surrendered. The site also boasts the Hudson’s oldest lighthouse, which was built in 1826 and operated for nearly 100 years. 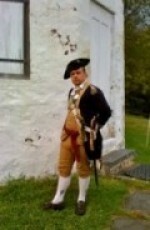 I was given a tour by site interpreter, Mike, in costume. The photo was taken next to the lighthouse, atop the site, from which the view is spectacular. Mike pointed out where the British ship Vulture had picked up traitor Benedict Arnold when he fled from West Point. I think Mike looks like Russell Crowe. During the Revolution, Elizabeth House Trist helped her mother run a boarding house in Philadelphia, where she met and was befriended by Thomas Jefferson who was a regular guest. When the War was over she summoned up “resolution enough to undertake the Journey” to Louisiana where her husband, a former British officer, had purchased some land. Leaving her son behind, she set out in December of 1783, for Pittsburgh where she hoped to winter over with friends. To us this hardly sounds like an expeditious route. But in her day, there was no easy way across the mountains in the south; nor was it easy to secure passage by boat to New Orleans, which was in Spanish hands at that time. 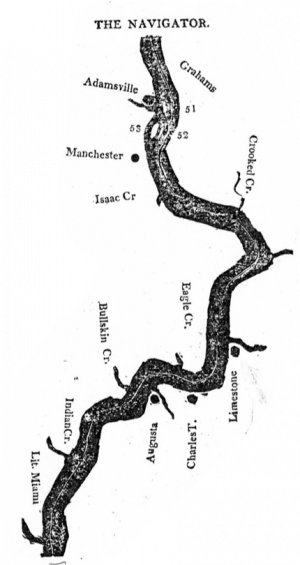 The standard route for travelers was across southern Pennsylvania, on to Pittsburgh, then down the Ohio River to the Mississippi by boat, continuing on by water to the intended destination. Trist included in her diary details she knew would be of great interest to Jefferson, in this instance, concerning Fort Pitt. Fort Pitt is situated upon a point of land form’d by the junction of … two rivers [the Monongahela and the Allegheny] with the Ohio. … On the Monongahala, where the town is chiefly built, there are about a Hundred buildings; all … in a very ruinous state. … The land is exceeding rich and abounds with an abundance of maple trees, from which they make quantitys of sugar. … The low land, lying between the river and the high lands or hills, is call’d bottoms, and nothing can exceed the quallity of those grounds. In the month of May they look like a garden, such a number of beautifull flowers and shrubs. There are several wild vegetables that I wou’d give the preference to those that are cultivated: Wild Asparagus, Indian hemp, shepherd sprouts, lambs quarters, &cc—besides great abundance of Ginsang, Gentian and many other aromatick. On the other side of the Monongahala, the land is amaizing lofty. Tis supposed that the whole body of it is cole [coal] and goes by the name of the cole Hill. At one side it has been open’d to supply the inhabitants with fuel. … The Hill is seven Hundred feet perpendicular, and on the top is a settlement. The land is fertile and capable of raising all kinds of grain. … In the spring of the year, the rivers abound with very fine fish, some of them exceeding good—particularly the Pike, which greatly exceed those that are caught below the Mountains in flavor and size, some of them weighing thirty pounds. The cat fish are enormous; some of them are obliged to be carried by 2 Men. The perch are commonly about the size of Sheep heads, but they have been caught that weigh’d 20 pound. There are several other kind—such as herring, &c—but different from ours. The bass look more like our Sea perch, only much larger, and I give them the preference to all the rest for their delicacy of flavor. This excerpt is from In the Words of Women, Chapter 9, page 279. An enlarged version of the map can be found HERE. The Florida Center for Instructional Technology is responsible for this excellent site for maps.